Check that top left-hand dial. I think we all know this, but it bears repeating: often, during the coldest periods of winter, the wind just doesn't blow. It's been like this most of the week, BTW. With tomorrow's weather forecast for the SE & East Anglia it could be "interesting times" for the National Grid. Surely....someone tell me, this is only a fable from some blackest imaginings? What say St Theresa of Westminster.........."more of the bloody same it is then". 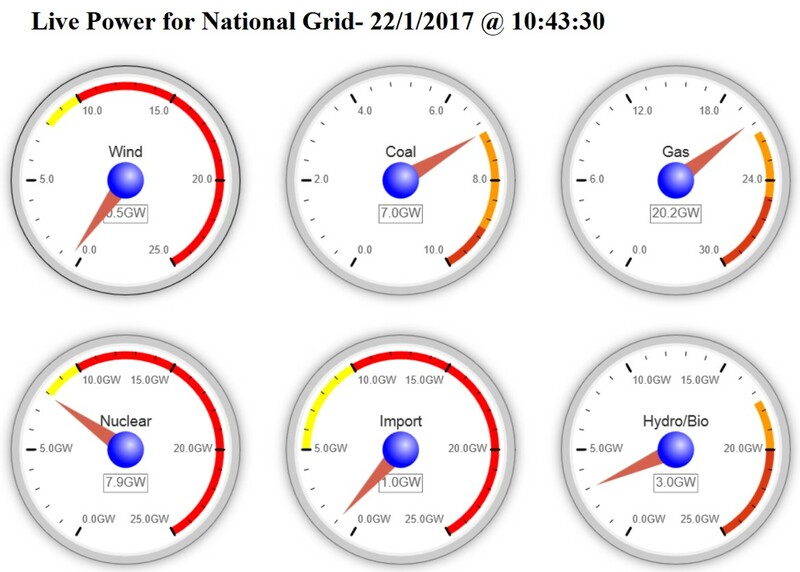 Gridwatch this morning (http://www.gridwatch.templar.co.uk/) shows Coal at 100%, Gas, Nuclear, and BioMass almost so, and wind at 1.28% producing just 0.62GW. What happens if one of the stations has to go offline for any reason? I think we can all guess. This is dereliction of duty, by the State, on a truly heroic scale. What do they replace wind with? Do they just turn up gas and coal? Is it good for the environment anyway as on windy days we reduce CO2 from gas and coal? I hope that wind power is a good idea but fear that it isn't. "What do they replace wind with?" Basically, it's a network of diesel generators. It's much less efficient than a proper power station and much more expensive. It's another way for opportunists to get rich off the taxpayer in the name of ecology. Looks like we need to burn more coal to heat the planet up. Brr! "I hope that wind power is a good idea but fear that it isn't." It was a good idea in the Middle Ages. Not in the 20C. Nuclear power is safe, extremely reliable, and releases no CO2. The problem is the high capital cost, which means that profits come only after a long time. Some of the new designs may be cheaper. I was going to rank this post as "Cool" on your voting scale but somehow it didn't seem quite appropriate. How about Brass Monkeys? Yes, it does say it all. transient generating is useless without storage or swing production to fill in the gaps. the challenge as i see it is that the amount of storage needed to fill a calm week is astonishing with current (lack) of technology. to run some simple numbers. wiki says lithium ion batteries can store about 250watt hours per kilo. fair enough, lets trust that. you could build a big battery and stick it on you house, like tesla famously does with a powerwall. 150kg battery like that would keep you supplied with 3kw for 12 hours or so, and thats nice if you have panels and a working grid. 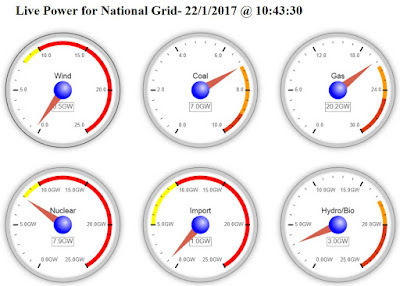 but scale up a bit, coal is going for 7giga watts on the above piccy. assume 'we' have built heaps more turbines and solar to replace all the coal permanently. how much current tech battery would we need to say provide 7gw x 24 hrs a day for say 7 foggy january days? quite a lot. tell me i'm wrong, but 7gigaw * 24 hours * 7 days at 250 w/h/kg suggests a quite astonishing 4.7 MILLION tonnes of lithium ion battery needed to act as the nations battery. or another way of looking at it, >30 years of all the output from the tesla gigafactory at 35gw h per year. Thats a lot of battery, or some coal kept on standby. All over this fair land, usually tucked away in some rural area (but always near pylons to which they're connected via transformers) are little compounds full of diesel generators and big tanks of diesel. This is our govts emergency strategy since the Blair era. The only thing I can't understand is, diesel generators and tanks of diesel in a known location usually present an irresistible target to one particular community. These compounds must have amazing security to keep out the sort of people who are happy to smash a digger into a rural shop's cash machine at 3 a.m - either that or they are being looted and HMG is keeping schtum as with Trident. Anyone know what the security's like? I can't imagine just a camera and locks doing much to stop the sort of people who'll smash a police helicopter to stop it monitoring them.
" solar will eventually be so cheap, you won't need storage at all." Cheap panels won't make the Sun shine at night. Intermittent power is good for tasks that can be done at any time, such as pumping water for irrigation, and perhaps splitting water to release Hydrogen for fuel. It is useless for running a city. fact remains: "if you invent an efficient means of storing electricity, you can name your university after yourself!" I'd have thought any chemical means of storing mega-large quantities of electricity will be inherently dangerous because of what happens in a short - even those house batteries might be vulnerable in a flood. And how would a battery capable of storing say 10 GigawattHours stand up to a missile hit? Not sure it can be done, but there are some clever people in the world. Safest would be to use the electricity plus some input of carbon/hydrogen (like?) to produce long-chain hydrocarbons i.e. synthetic heating oil that's fairly safe to store. Get the carbon from the air (how? ), split water and pinch the hydrogen to make your long-chain hydrocarbons. Use the captured oxygen for efficient combustion when you're generating at night. But in that case why not just remove the carbon from power station stacks, car exhausts, central heating outlet vents i.e. something that a lot of clever chemists can't currently do viably? Just thinking out loud. Re STOR (diesel generators etc backup), looking at National Grid's website it seems they contract options for about 2GW of STOR, priced between £67.50 and £178 per MWh for 8 months of the year, and £67.50 - £220 per MWh for 4 months (winter?). That doesn't seem that terrible to me for a call-up reserve. The lower end contracts are cheaper than baseload Hinkley Point C, which with inflation would be at around £96/MWh now if it was running. I wonder how easy it is to get the lower end contract. I wonder if it is like those very cheap flights you see advertised which all seem to have sold out when you phone up. OT: I see the FT reporting on Toshiba's woes is talking about getting out of new nuclear bids and trimming back its nuclear business to "building turbines and other equipment" and maintenance of plant it already built. Unclear yet what this means for the UK subsidiary NuGen and the proposed Sellafield new Westinghouse AP1000 nuclear. [Toshiba] said on Friday it was “re-examining its relationship” with Westinghouse — the struggling US nuclear group in which the Japanese group bought a controlling stake a decade ago. Mr Tsunakawa used Friday’s press conference to apologise for the “damage caused” to investors from the Westinghouse subsidiary, where delays and cost overruns on nuclear construction projects in the US will now be expressed as writedowns that analysts estimate could be as high as $7bn. Very good job Gordon sold Westinghouse in 2006 for a vast $4.3 billion profit (400%) over 7 years, otherwise we'd be paying the tab Toshiba is now paying.